I have to say…I am all about the blog events. Only having been doing this a short time, I find the food blog community endlessly fascinating…and there is always a good "social event" going at all times. These events have been such a motivation to try new things. This weekend, Alicat (whose foodblog Something So Clever rocks the catbox) – one of my new "blog buddies" – was hosting her first Weekend Cookbook Challenge. For us foodies, is there really anything better than a good excuse to go rifling through your old cookbooks? I think not! The theme for the challenge was "What was your first cookbook? Pick a recipe from it and make it to share with the class." Wow…what was my first cookbook? Well…I actually do know what it is. The Joy of Cooking. I’m pretty sure that it was given out as standard issue with an apron and some feminine products after I watched a filmstrip in middle school. 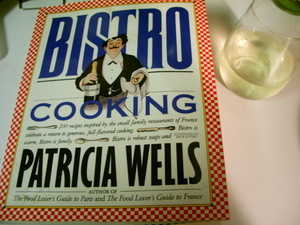 The SECOND cookbook I ever got was something I bought myself – Bistro Cooking by Patricia Wells. You can tell its an old cookbook because, unless its a church fundraiser, I ain’t buying a cookbook without any photographs in it. This paperback cookbook is ALL substance and no style. No matter, though. Some of my favorite comfort dishes come from this book – nothing like sausages and potatoes cooked in fat to take the edge off on a cold day. Since its just starting to get chilly in Atlanta, I thought a soup recipe might be the ticket. 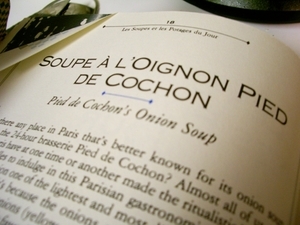 The first recipe in the soup section caught my eye: Pied de Cochon’s French Onion Soup. I am a hugenormous fan of french onion soup. As I looked over the recipe it seemed simple enough: soften some onions in wine, add to broth, top with cheese and bread, broil. One thing did strike me as odd: this recipe was made with chicken stock. Almost every version I’ve ever had is made with beef broth or something much richer than chicken stock. C’est la vie…let’s get cooking! The main point that Patricia Wells stresses in this recipe is to use white onions. According to her, yellow onions would be too bitter and would ruin the soup. Being in the land of Vidalia onions, this was cause for me to raise an eyebrow. I stayed the course, though. A pound of onions in an oven safe baking dish with wine and butter…and we’re off for 45 minutes of baking. Voila! The finished product. 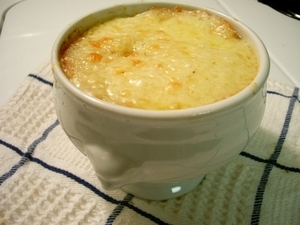 A couple minutes under the broiler and you have hot, bubbly, fabulous french onion soup. The taste verdict? 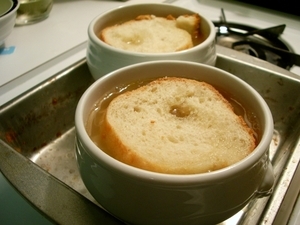 Its quite good – but also quite different from most versions of french onion soup that I’ve had. Its much lighter – none of that heavy, beefy, salty taste. Do I mind doing without it? Not at all. This would be wonderful with a frisee salad dressed with a light vinaigrette. It’s quite the perfect French bistro meal – without the hefty price tag you’d encounter at Au Pied de Cochon. 2. 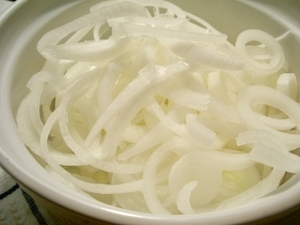 Combine the onion, wine, and butter in a baking dish and braise, uncovered, until the onion is very soft and has absorbed most of the liquid, about 45 minutes. Increase the oven temperature to broil. Hey there! Thanks so much for participating girl! See my page for my selections…have fun! I have this cookbook too. Patricia Wells is great. I once worked in a French resataurant where there were certain foods we could eat as much as we wanted of, and onion soup was one of them. Great benefit of the job.